​Nominal Pipe Size (NPS) is a North American set of standard sizes for pipes used for high or low pressures and temperatures. Nominal pipe size refers to only the outside diameter (OD) of a pipe making it somewhat vague. For example, when we say pipe size is 2 NPS, it refers to all the pipes having 2.375-inch (or 60.3 mm) as outside diameter irrespective of wall thickness and thus the inside diameter. Specific pipe is identified by pipe diameter and another non-dimensional number for wall thickness referred to as the Schedule (SCH). Pipe schedule sets the pipe wall thickness. Increasing the wall thickness of the pipe increases the mechanical strength of the pipe, allowing it to handle higher design pressures. The terms Nominal Bore (NB) and Nominal Diameter (DN) are also frequently used interchangeably with Nominal Pipe Size (NPS). Nominal Bore (NB) is European Designation equivalent to NPS. For NPS 5 and larger, the Nominal Diameter (DN) is equal to the NPS multiplied by 25. SCH 5, 5S, 10, 10S, 20, 30, 40, 40S, 60, 80, 80S, 100, 120, 140, 160, STD, XS AND XXS. Stainless steel pipes, due to less risk of failure due to non-corrosive property, permitted the use of pipes with thinner wall thickness. Initially thinner pipe schedules 5S and 10S had been created and afterwards other “S” sizes followed later. Stainless steel pipes are most often available in standard weight sizes (noted by the S designation; for example, Sch 10S). However stainless steel pipe can also be available in other schedules. Due to their thin walls, the smaller “S” sizes can not be threaded together according to ASME code, but must be fusion welded. Schedule Standard (STD) is identical to SCH 40S, and 40S is identical to 40 for NPS 1/8 to NPS 10, inclusive. Schedule Extra Strong (XS) is identical to SCH 80S, and 80S is identical to 80 for NPS 1/8 to NPS 8, inclusive. Schedule Double Extra Strong (XXS) wall is thicker than schedule 160 from NPS 1/8 in to NPS 6 in inclusive, and schedule 160 is thicker than XXS wall for NPS 8 in and larger. Nominal Pipe Size and Schedule collectively sets the pipe outside diameter (OD) and the wall thickness (and hence the internal diameter (ID) is automatically fixed). For example, NPS 14 Sch 40 has an OD of 14 inches (360 mm) and a wall thickness of 0.437 inches (11.1 mm). 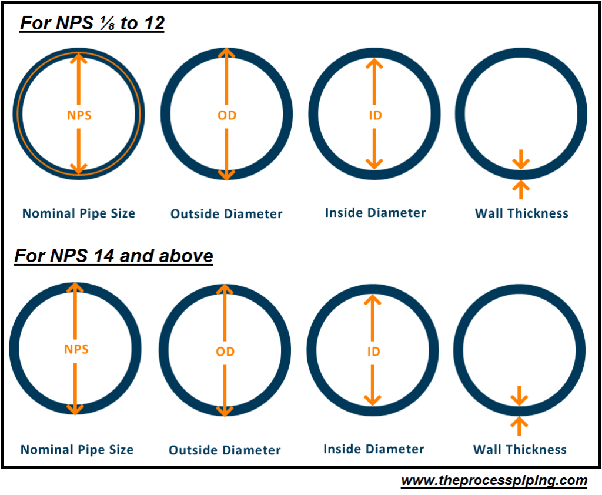 However the Nominal Pipe Size (NPS) and Outside Diameter (OD) values are not always equal, which can create confusion. For NPS ⅛ to 12 – The NPS and OD values are different. For example, the OD of an NPS 12 pipe is actually 12.75 inches (324 mm). To find the actual OD for each NPS value, refer to the reference tables which are based on ASME standards B36.10M and B36.19M. For NPS 14 and above – The NPS and OD values are equal. In other words, an NPS 14 pipe is actually 14 inches (360 mm) OD. For a given NPS, the OD stays fixed and the wall thickness increases with increase in schedule number. For a given schedule number, the OD increases with NPS while the wall thickness either stays constant or increases. Using equations and rules in ASME B31.3 Process Piping, it can be shown that pressure rating decreases with increasing NPS and constant schedule. line sizing calculations. As discussed above, for a given Nominal Pipe Size (NPS), the pipe Outside Diameter (OD) remains constant. As the pipe schedule changes, the ID of the pipe changes. by the pipe NPS minus double the pipe wall thickness (which can be obtained from the pipe schedule). Pipe ID = 324 mm – 2 x 10.4 mm = 303.2 mm. It is worth bearing in mind that wall thicknesses come within a specified tolerance, depending on the engineering standard used. A typical wall thickness tolerance is 12.5%. This means that the actual internal pipe diameter may vary slightly from that quoted above.